Our local plumbers cover the Irlam area, Manchester. We cover all aspects of plumbing work no matter how big or small it is, if water runs through it we do it! 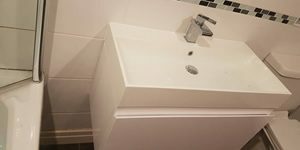 Our team have over 10 years of experience working in the local area and have worked with a wide range of customers; from domestic customers needing repairs to leaking taps or burst pipes to full bathroom refurbishments, redesigns and radiator installations. We are also happy to find and fix faults with your water system. This could be locating the source of unusual noises of damp patches or flushing your heating system to improve the heat distribution to the radiators throughout your home. We are also happy to help you with adding in more radiators or with the installation of a new washing machine or dishwasher. We strongly believe in offering great service to our customers in the Irlam area and will always do our best to save you money. Best of all we don’t charge call-out fees!